Fragile Happenstance | W. Wayne B. Posted on January 22, 2013	by W. Wayne B.
I see the opening flowers. Each petal is a perfect creation. I watch a peaceful light fall on their leaves. White and red are scattered around the garden. I renew this experience every spring. The sun warms their hidden seeds. The flowers turn up toward the sky. I watch them flutter under the clouds. My flowers are truly beautiful. 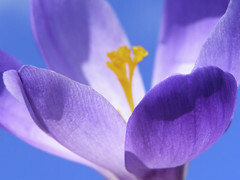 This entry was posted in Poetry and tagged clouds, flowers, light, petal, poem, seeds, spring, z1757. Bookmark the permalink.